What are dentists currently using lasers for? These devices have been proven to help in the detection and treatment of oral diseases. They can be used for treating gum disease, detecting cancer, and pinpointing tooth decay in its early stages. They can precisely remove tissue, seal painful ulcerations like canker sores, and even treat small cavities. In the future, laser dentistry technology will undoubtedly find even more applications. Laser dentistry take advantage of the quantum behavior of electrons, tiny particles inside atoms. By stimulating atoms with pulses of energy, and then using a method of optical amplification, they cause the atoms to produce a beam of coherent light. Essentially, that means that they emit light which has a great deal of energy, yet can be precisely controlled. It's the combination of high energy and precision that make lasers so useful. For the treatment of soft tissue problems, laser dentistry has many advantages. They are minimally invasive tools that generally involve taking away less tissue than conventional methods. Used in gum surgery, for example, lasers can treat gum disease by killing harmful bacteria deep in pockets below the gum line, and removing the diseased tissue without harming the healthy tissue. They can also remove the thin layer of cells that inhibits reattachment of the gum and bone tissues to the tooth, while sealing off the adjacent blood vessels. This type of procedure generally results in less bleeding and pain. 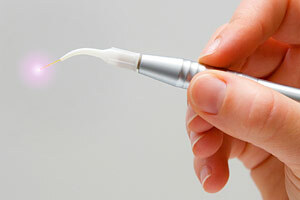 Lasers are also effective in treating ulcers and sores on the lips or gums. For more information on Laser Dentistry in the Houston, TX area call Ritsco Prosthodontics Advanced Dentistry at (713) 528-0377 today!